Home Office Adventure : Camille Gracie, ASID Interiors Inc. Yesterday, I posted to my Facebook friends that I had found a cow. Of course I know that none of my pals lost a cow, but I thought it a humorous addition to the countless lost dog found dog posts that sprinkle through the daily news feed. My first call was to the closest neighboring dairy farmers. The English neighbor quickly verified that it was not his. When I described the cow as a calf bearing ear tags and a ring through its nose, he cautioned me that it may be a bull calf, and to be very careful handling. Soon, there was a very young Amish boy in the drive. Behind him, his older brother, barefoot on horseback. Nope, not theirs either. Since this was not going as smoothly as the many “come and claim your cow” episodes I’ve had in the past, I felt a responsibility to catch and keep the cow until I could find the owner. With no cow handling experience (save some arm waving here and there) and bearing in mind my previous warning, I set about the task of getting the little bugger into an empty paddock. Contrary to the warnings however, it seemed very passive and interested in my companionship. For those of you that know me, you know how instantly attached I become to animals in my care. To a fault really, as I am a mess whenever it’s time for one to move on, either in this world or the next. As the day progressed, my new little friend laid in the shade. It was obviously exhausted from the journey that led to my farm, and appeared to feel comfortable and safe enough to rest. 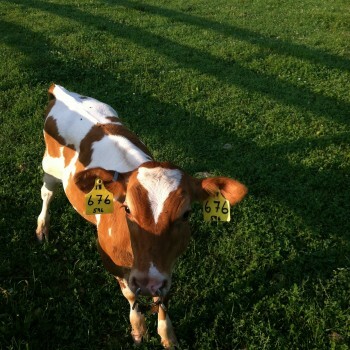 Armed with pictures in my iphone, I began visiting the farms that appeared to be dairies. There was a variety of emotion attached to these visits. If this was a bull calf, as I was led to believe, it would either have the life of riley as a stud, or quite the opposite. As I traveled down gravel drives, into different worlds, some of the conditions were less than ideal either way. Because I have a sizable creek through my property, there was the possibility that the recent storm had caused this little cow to wash onto the property from far away. Most of the cows around here are black & white dairy cows or black angus. My little cow was red & white. That may have had no significance, but since it looked different, I assumed it was different. I went several miles along every road leading to my farm. Before heading in a new direction, I would come home to check on my friend. My last trip before sunset would be in the direction of the grocery store. I decided to hit all of the farms on that route, and wind up doing some marketing. The second farm I visited was 5 miles away (less as the crow flies). As I pulled into the drive, there was a charming farmhouse to my right, a cow barn to my left with calves having dinner, and a field of older calves beyond. All of the youngsters were varied in color…I was encouraged. I called in the direction of the far barn, and was greeted by a woman carrying two large jars of milk. When I asked her about a lost cow, she explained that they had no bull calves, so it could not be hers. She agreed to look at the picture, and instantly identified and claimed the calf. Not a bull! 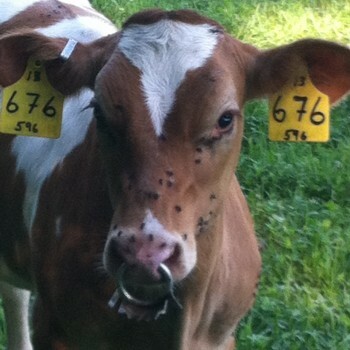 The ring was for weaning purposes (and was not pierced) to keep a weaned calf from suckling on other young calves. And yes, it was theirs, although they didn’t realize they had lost her. Relief on many levels! I loved this charming little organic farm. I loved this young couple and their two toddlers! I loved their obedient blue tic healer! I loved that I could let my little cow go home and not regret it (completely).